Situated in the Rhône Valley just off the autoroute, this is a pleasant site with views of the surrounding mountains. It is set in a peaceful wooded location, although there is occasional aircraft noise. There are 125 individual touring pitches, ranging in size from 60 to 155 sq.m. all with 4A electricity, many with some shade and 25 with water and drainage. Pitches are priced according to size and facilities. The reception, office, lounge, shop and restaurant have all been completely rebuilt. The conservatory-style restaurant overlooks the pool and the entertainment area. Both are open to the public but free to campers. A warm welcome is assured from the enthusiastic English-speaking owner. A new barrier has been installed. 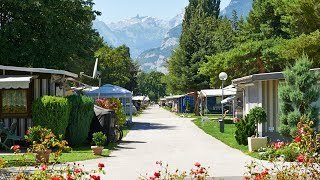 The owner has succeeded in making this a family friendly destination site, carefully siting exuberant activities away from the quieter camping area. Apart from activities for children, there are now tea dances, Zumba classes, bingo and discos, but not into the early hours. The pool is always supervised by qualified personnel. Further investment has taken place in making the site environmentally friendly with solar power and geothermal energy used to heat the pool and sanitary blocks, plus a large recycling facility. Visitors with long units are advised to phone ahead to check the availability of suitably sized pitches. New sanitary block and another completely renovated. Some private cabins in the heated sanitary block. Washing machines and dryers. Shop. Brand new restaurant (closed Jan) and terrace. Bar. Bakery. Ice cream kiosk. Takeaway. Heated swimming pool with slides and diving board (15/5-31/8). Playground. Table football and electronic games. Tennis. Basketball. TV room with Internet corner. Entertainment stage. Multi-lingual library, board games and tourist information. WiFi on part of site (free). 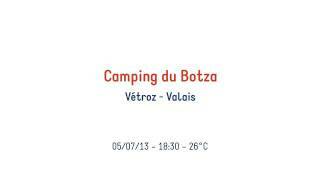 From the A9/E62 between Sion and Martigny, take exit 25 Conthey/Vétroz and go south towards ‘zone industrial’, after 200 m. turn right to ‘Camping 9.33 Botza’ and follow signs. Site is 2.5 km. from autoroute exit.